The orchestra was rehearsing for an upcoming concert. The conductor was a man reputable for his ability to take a group of musicians and mold them into a great orchestra. He would bring the group together, highlight their individual talents and then form them through the symphonies they were rehearsing into one beautiful sound. The story highlights the fact that no matter how small their role might seem to be, every musician in the orchestra matters. Each one makes a contribution to the orchestra that sometimes only the conductor can hear or know. In order to play the symphony well and to make that beautiful sound all the parts are needed and important. Jesus approaches Peter and Andrew as they are doing their work. He says to them: “Come after me, and I will make you fishers of men.” Similarly he approaches James and John and calls them. Before looking at the response it’s best to consider the call. Jesus is on his mission. As already mentioned, the public phase of this mission has now begun. With his arrival the “time of fulfillment” is now “at hand.” Everything will change as a result of his mission. The proper response is repentance and belief. Now Jesus calls his first disciples. They are to follow Jesus. The call for repentance and belief is also theirs as it is for all. The disciples will spend time with Jesus coming to know him, who he is, why he is here, what he is about, what his mission is, who his Father is who sent him on mission and how that mission will be accomplished. They will have to live with Jesus on this mission. They will have to see him interact with people, they will see him pray, they will see him perform miracles, they will see his authority expressed over nature, illness, demons, even the law; ultimately they will see him die and they will encounter him again risen from the dead. They will come to know and love this Jesus who calls them now. The second part of Jesus’ call regards their future role in the mission – they will be “fishers of men.” The role will be taken up in the future but first they must be prepared. In order to be prepared they have to “follow” Jesus and be with him. Peter, Andrew, James and John will have an important role in the mission of salvation. They will carry on the mission after Jesus ascends to the Father. Their mission will be his mission – the call to repentance and belief. In one sense, the mission is akin to that of Jonah to the Ninevites recalled in the first reading for today’s liturgy. Jonah’s task of proclamation was quite large because the city of Ninevah took “three days to go through.” Yet he went and proclaimed. The people responded in both belief and repentance (signified when “they proclaimed a fast and all of them, great and small, put on sackcloth.”). God was greatly pleased at this and relented on the punishment he was to have given for their evil deeds. Now we should consider the response. Peter, Andrew, James and John followed. St. Mark tells the account emphasizing the immediacy of their response and in dramatic fashion the great demand of discipleship. The first disciples leave their work, their livelihood, their security, their families, their neighborhood, their friends, their surroundings. The manner in which Mark describes the call and response is to emphasize that in discipleship nothing can be “saved” for oneself in following Jesus. A transformation is demanded and will take place so long as the disciple continues to “follow” Jesus — learning from him and responding in faith. The immediacy that Mark describes is akin to St. Paul’s exhortation in the second reading from the First Letter to the Corinthians. Paul speaks of living in the present full of expectation of the Lord’s coming. His emphasis is to live today as though the Lord would arrive today. In doing so our focus will be on the Lord not on whether we are married or single, whether we are filled with sorrow or gladness, whether we have a job or not. In other words, all things will have their proper place so long as our focus is on the Lord Jesus and our relationship with him. Each of us has a vocation in life. In fact we all share in the one vocation to which everyone is called — to be disciples of Jesus Christ. As disciples we enter into a relationship with our teacher Jesus. He is the one who will lead us and guide us, he will bring out the good in us as repentance takes hold and sin is forgiven. He will draw us to himself and in that loving relationship we will be strengthened for living good lives of loving God and neighbor. And each one of us will in some way contribute to his mission of salvation. Peter, Andrew, James and John are told that they will be “fishers of men.” The Gospel, which is beginning to be proclaimed now by Jesus, will be proclaimed later by them or better, as they will come to see, by Jesus in them. As Jesus calls them to follow him, they will call others to follow him as well. As the public ministry unfolds and when the time is right, Jesus will appoint these four along with others as “apostles.” The term apostle means “one who is sent.” Jesus does the sending. He sends them on mission, his mission, to continue the work of salvation. Their role will be one of leadership within the communion he establishes yet the role of proclamation and invitation is shared by all the disciples of Christ. Dear Monsignor, I like your analogy of the orchestra. Often, I tell students to think of a puzzle. If one piece is missing, the picture is incomplete. We can all apply this idea to Christ’s invitation. Discovering how God is present in every part of our lives and then sharing His invitation with everyone is a gift. Would that everyone would or could accept this precious gift. Msgr. Prior, remember me? I’m Bill Guy’s mother. 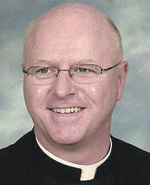 He graduated the seminary in 1987, but decided not to proceed to the upper school. He married and has 5 children. My husband, Bill Guy, Sr. is being buried tomorrow from St. Ephrem’s. We had moved in 2012 to Wood River Village (not far from you). Bill will be doing the eulogy tomorrow. He cantors at St. William’s every weekend. Just wanted to let you know I enjoy your column every week. Mary Rita Guy.